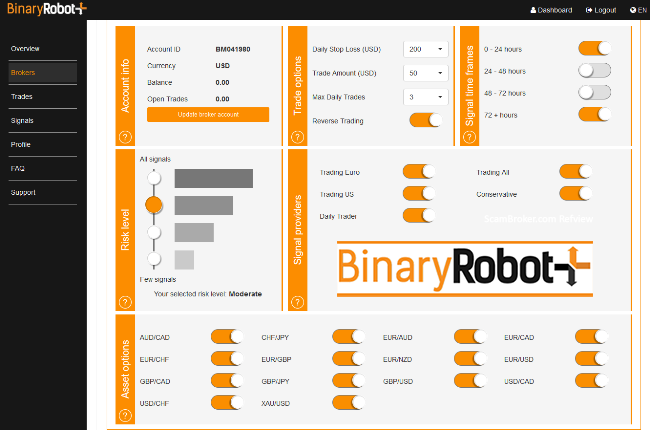 Forex Robot Plus is an automated trading software for Forex CFD trading, formerly know as the Binary Robot Plus. The software is a free SAAS (Software as a Service) and it is not owned by a Forex or Crypto broker. You can currently choose from 5 different brokers to connect with the robot. What sets the Forex Robot Plus apart from many other auto trading Forex signals software, is the professional design and usability of the roboadvisor. The system was designed by experienced programmers who have many years of experience working on algorithm trading systems. The software is so advanced with many options for customization, that some newbie traders are actually put off by the abundance of choices they must configure for the robot to work. They don’t have fake videos with actors. There aren’t any guarantees of performance. No fake sales pitch videos with fancy yachts. The robot has five sections. Trade Options, Signal Time Frames, Asset Options, Risk Level and Signal Providers,. Trade Options: This section is where you will setup your trade amount, max daily trades, reverse trading, and your daily stop loss. Asset Options: ForexRobotPlus can generate trades on up to 16 different currency pairs. Risk Level:The robot has 4 levels of risk to choose from, going from All Signals down to Few Signals. Signal Providers: There are four different signal providers available on the robot. You can select either, Trading Euro, Trading US, Conservative and Daily Trader, or Trading All to have all signals come through. Signal Time Frames: In this section a trader can specify which CFD durations to trade. It is important to know that historical results on any automated trading software are never accurate, especially when the software has multiple configuration options. It is for this reason they do not publish average win rates. When you compare the various Forex automated trading robots, the biggest problem traders have is finding a software that works with a licensed broker. This software is currently connected with the following brokers: TradeToro, Capital Traders, BrokerXP, Cryptonxt, and EuropeFX. We anticipate that they will add more brokers soon, and hopefully some licensed brokers as well. One of the reasons that a software will use multiple brokers, is so that you have the ability to use different algorithms at various brokers.